Apr 24, 2019 Out now! Fan-favorites Tangle the Lemur and Whisper the Wolf take the spotlight in this special preview for their upcoming mini-series adventure! Check out a sneak peek of their next adventure as two of the newest and already most beloved Sonic characters team-up! Also includes a recap of Season 1! In Sonic's world, adventure awaits around every corner, but even the world's fastest hedgehog can't be at the center of all of it! Join Sonic and some of his coolest friends in adventures that show just how wonderful Sonic's world really is. Sonic's been infected with a mysterious new virus and his speed seems to be his only saving grace. Can Sonic, Tails, and Tangle beat the disease before Sonic's beat? And who will be the virus' next victims? As the infection spreads across a helpless city, the Chaotix Detective Agency stands alone against the horde. Will even the world's fastest hedgehog be quick enough to provide back-up, or will the city fall? The Chaotix take the case as things go from bad to worse! Eggman's reign of terror continues! 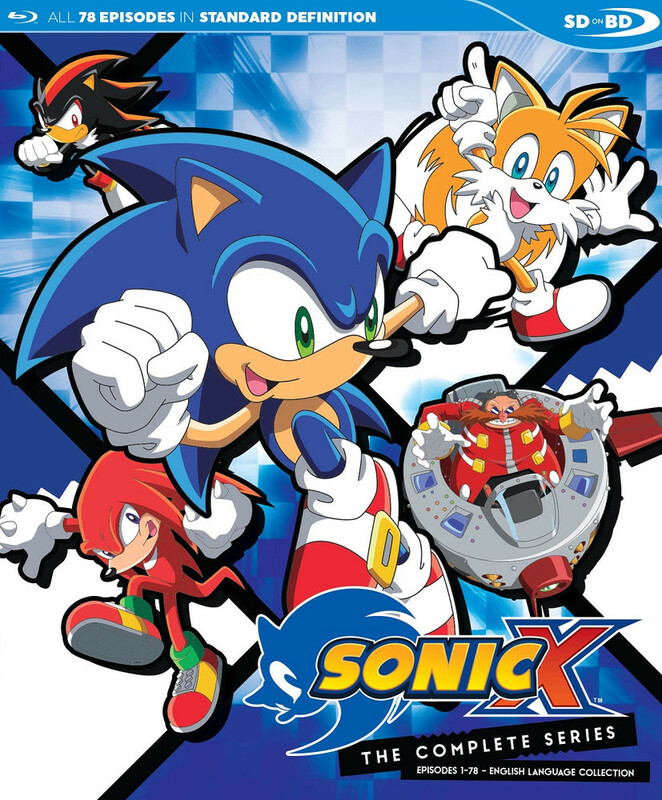 Sonic races to help Team Dark rescue civilians from a major city, but his own metal virus infection is getting worse! Outnumbered, how long can Sonic outrun the inevitable? And who else will fall? A major cornerstone of the metal virus saga! One of Sonic's most powerful allies falls victim to the disease, but who? Tangle the Lemur's got a problem: there's not enough action in her life! Whisper the Wolf's also got a problem: she's hunting down an incredibly dangerous enemy named Sonic the Hedgehog! Can Tangle and Whisper help each other solve their problems, or will they just make things worse? A new mini-series featuring two of the most popular new Sonic the Hedgehog characters! Tangle & Whisper are a classic odd-couple in this adventurous team-up! For fans that are just getting up to speed, Team Sonic Racing combines the best elements of arcade and fast-paced competitive style racing with nostalgic characters and environments from across the Sonic Universe. Play solo or with up to 12 drivers online as Sonic, Shadow, Tails and other beloved characters in thrilling single and multiplayer game modes, including Grand Prix, Time Trial, Team Adventure. Throughout the race, players will be able to utilize various team mechanics including Item Transfer, Slingshot, Skim Boost and more to assist your teammates throughout the race to secure your spot atop the podium while having the option to customize their vehicle to suite their racing style. 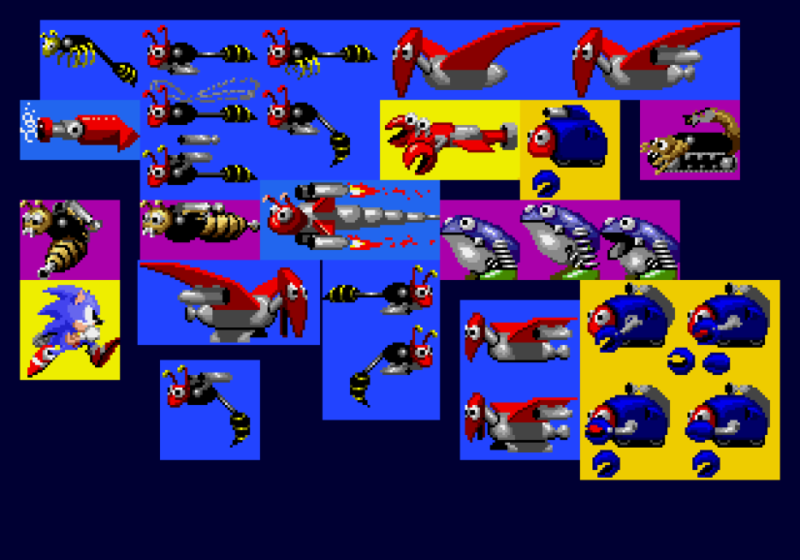 New Sonic 2 assets uncovered! Throughout the many years since Sonic 2 was released we have gotten little details into the development of the game and very interesting info about scrapped portions and assets. Very notably the time travel mechanic as seen in Sonic CD was once going to be in Sonic 2. Now thanks to MegaBites Blog we have new info on unseen badniks, unreleased Mega Drive/Genesis games and GENOCIDE CITY ZONE. Where did this info come from? Jason Moorhouse (the owner of California-based retro video game store, Nostalgia Alley) met with Sonic 2 Level Artist Tom Payne at a garage sale and got a box full of Genesis era development leftovers. Jason: He had one small box of stuff left from his days at Sega and LucasArts including paper design specs of level lay outs, character designs, floppy disks with lables that read ‘B-Bomb’ and ‘Sonic Enemies’ among others, CD-Rs of the game ‘Yoda Stories’, a SNES prototype of ‘Big Sky Trooper’, a few awards he was given while at Sega, employee jackets and enamel pins. He gave me a few of these items including all the floppy disks, the ‘Big Sky Trooper’ prototype, Yoda Stories CD-Rs, and one of the awards from his work on ‘Sonic Spinball’. That's just a little snippet of the information revealed. If this kind of stuff interests you, you can see more pictures and info at MegaBitesBlog . Sega tweeted out an update on the Genesis Mini and... boy is it a big'un. Sonic 2 was confirmed, which I sorta predicted in the previous post. On the third party front we got Contra: Hard Corps (hell yeah) and Earthworm Jim (woah, whaaat). Other highlights include Shinobi III and Streets of Rage 2 (two must-haves), Thunder Force III (nice), and Landstalker (a great action-RPG). But the REAL stunners here are... both Castle AND World of Illusion, two classic Mickey Mouse platformers. I'm actually shocked. Never would I have expected anything Disney on here. Could this mean... Aladdin actually has a real shot at being included on this thing?? I feel like anything's possible at this point! And hey, Sega has the license to Tetris for that Puyo Puyo crossover. And Japan got a home port of their Tetris arcade game... but let's not got ahead of ourselves. The lineup for this thing looks absolutely STACKED, and only half of it has been revealed. Scope out the official website for all 20 games confirmed so far. With this and M2 handling the backend, Sega really ain't playin' around here, y'all. Nintendo dropped a surprise Smash Direct last night, and the news everybody's talking about are these two new Mii Fighter costumes!! 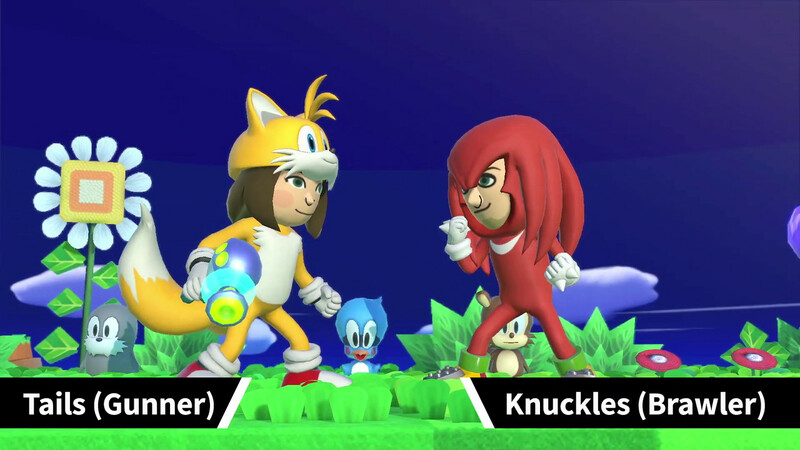 It's a Tails outfit for the Mii Gunner and a Knuckles outfit for the Brawler. They'll be on sale for 75 cents each... um, whenever the 3.0 update drops... tonight?? Of course, being Mii costumes probably deconfirms them as potential DLC characters. But that's okay, right? Oh yeah, there was also info on some Joker guy. Whatever. Hello everyone, we've installed a gallery where you may upload your fanart. It's connected to the forum but you don't need to be registered to upload art there, you do however need to be registered to edit, delete, or leave comments. We have categories for general fan art, fan comics, wallpaper/banners, userbars, signatures, sprites, and a random category. Let us know of any other categories you may want added. Sonic 3 A.I.R: The Definitive Sonic 3? Sonic 3 is in a rather complicated situation. With more than a few of it's music tracks being surrounded in a sea of legal and licensing troubles, that seems to be the popular reason why Christian Whitehead and Simon Thomley were never allowed to remaster it as they did the other Classic Sonic titles. Among that, it may also be why Sonic & Knuckles on its own appears on far more compilations and Sega Genesis clone consoles than Sonic 3 has in many years. So, when the officials can't provide, the fans must step up to the plate. Enter Sonic 3 Angel Island Revisted, or, Sonic 3 A.I.R for short. This is a project that's been making the rounds for a while now, and only recently saw a full release. Developed by Eukaryot, Sonic 3 A.I.R introduces a 16:9 aspect ratio, 60 fps, a Time Attack mode in which you can race against Ghost Replays, and other quality of life improvments that make an already great game even greater. Perhaps the best additions, beyond the preformance updates and bug fixes, is the added Drop Dash from Sonic Mania, and the ability to play as Knuckles and Tails together. More welcomed additions include Super cancel and being able to cancel Tails' flight and in-game achievements. Completing these achievements is how you unlock the three secrets in the game, being the Drop Dash, Knuckles and Tails, and another that I myself have yet to unlock. Sonic 3 A.I.R sets out to improve Sonic 3, and, in just about every regard, it succeeds. But those of you who follow the Sonic modding community may remember Sonic 3 Complete, another modification that sets out to improve Sonic 3 and adds more customization options than possibly any Sonic game or mod to come before it. How does A.I.R compare? Well, one important thing to note is that A.I.R also hasn't had a final release yet, as Eukaryot is constantly taking feedback and suggestions on Twitter and will be implementing them in future updates. Sonic 3 Complete was finished years ago and likely won't see any updates again. It may, perhaps be too early to say, since I've only done an all Super Emeralds run with Sonic and Tails, and have only started my Knuckles playthrough, but I would venture so far as to call this the definitive way to play Sonic 3, and the closest we'll come to a TaxStealth remaster. Sonic 3 Complete, as it stands, offers a bit more, but what A.I.R does offer sets it over the top. Perhaps one day Sega will work out whatever trouble they're having and we can have the best of both worlds. That's the dream, isn't it? Sonic HQ Old Enough To Drink! The site is now 21 which in the US is the legal age to be able to drink alcohol. Not sure why I felt compelled to share that. Anyway, I'll use this opportunity to share some of the upcoming features that have recently been implemented and some that are planned down the road. In case you haven't noticed, on the left side bar, the "upcoming comics" is no longer just comic releases but also games, movies (even if just the one for now haha), and other misc events like the SXSW panel that we had last month. It will also be kept up to date. You can also toggle off the entire sidebar using the button in the top menu bar. You like games? Yes? Of course! We're hoping to bring this section back also this year. Once again, we'll let you know when we have more information to share. Should we bring this back? Let us know! There will also of course be new general sitewide improvements. Stay tuned! Anything else you want to see here? Please let us know in the comments! 13th anniversary of our forum! Hello everyone! It is the 13th anniversary of our forum! But wait! Why is the forum not as old as the site and why is it not the one I remember? Let me explain. I, Metallix, started Sonic Blast in 2006 with the ethos that there needed to be a high quality Sonic forum that did the franchise justice. Most Sonic forums either used eye searing colors or just had a few Sonic images plastered on a default skin with no customization. I wanted to make a forum that not only had a high quality design but had Sonic very much integrated into everything as well as having a friendly environment for users. For several years the forum was the most active Sonic forum on the web with 30k posts during some months. Then social media came and ate our lunch but we continued on. We had used InvisionFree which turned into Zetaboards but they recently closed down and got absorbed by Tapatalk and Tapatalk does not allow for much customization which severely hampers our ethos so we had to switch to self-hosted. The old forum's final tally was 1.25 million posts. Mid 2017 Sonic HQ and Sonic Blast teamed up. 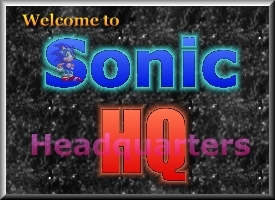 I was looking for affiliates and I remembered Sonic HQ. To my amazement it was still up and running. Even being updated! We became affiliates but I thought, "why not join forces so we can finally have a site and Sonic HQ can have a great forum." And thus our partnership began. It has been great so far, I look forward to the future of Sonic HQ and will do my best to make it the best it can be! Check out the history thread in our forum for a more detailed write up of our history and some pictures of the evolving theme we've had from the start. Hope to see you around! 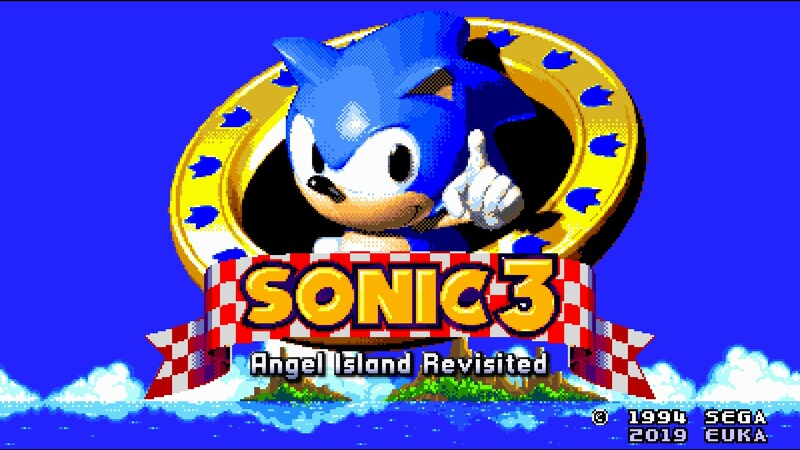 SONIC 3 – ANGEL ISLAND REVISITED (Sonic 3 A.I.R.) 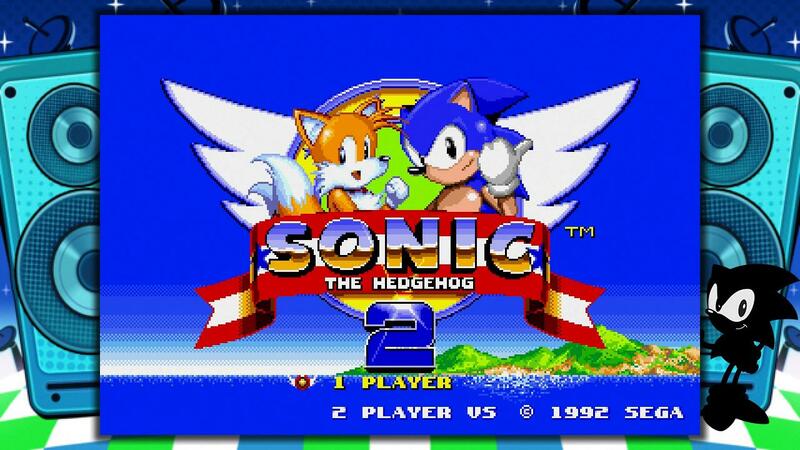 is a PC port of the original Sonic 3 & Knuckles. Interested in giving it a try? You’ll need the Steam version of Sonic 3 & Knuckles installed, which Sonic 3 A.I.R. is built upon. Reminder: Sonic X up for preorder on Blu-Ray. The good folks at Disctek Media are bringing all 78 english language episodes in one volume. This includes the extras from the DVD version as well as the original pitch video where the world of Sonic X had a lot less humans. It is releasing on May 28th and up for preorder at quite a discount. Keep in mind this isn't in HD, it's SD video on Blu-Ray and hasn't been remastered. This is the first time I've seen this as usually SD discs are put on DVD but the added benefit of these being on Blu-Ray is less discs are needed due to the larger file size. The Blu-Ray retails for $69.99, but you can pre-order it from rightstufanime right now for $45.47. In case you have forgotten or not aware, jump on this deal while you can!